The theme of the John Brown Jamboree was "Back to the 80s" and some of the advertising featured John Brown in a DeLorean, similar to what Michael J. Fox drove in Back to the Future. We found there was a lot to see and do, including a dog agility competition, petting zoo, different vendors and a car show where the best of the best antiques and vintage mobiles were displayed. There was a helicopter giving rides and it could be heard circling the city. We even met with some Civil War re-enactors from the 65th Enrolled Missouri Militia encampment and talked about life during that period of time. One of my favorite parts of the trip was a visit to John Brown State Historic Site, where you can tour the Adair Cabin. Florella Adair was John Brown&apos;s half sister and in this amazing special tour in a tiny cabin, guided by Mary Buster, we were given a brief lesson in history and surrounded by life in the 1800s. We walked away learning so much about Florella, her husband, and of course, John Brown, that I could write an endless amount of words telling you about this seemingly fiery, mad-as-hell man in history and what he was really like but I wouldn&apos;t want to ruin the experience for you. I can say that the images in my mind that I walked away with vastly differed from the famous John Steuart Curry painting at the Kansas State Capitol. I would highly recommend going to this historic site, and especially when Mary is giving a tour as she herself is a part of the John Brown and Florella Adair family. 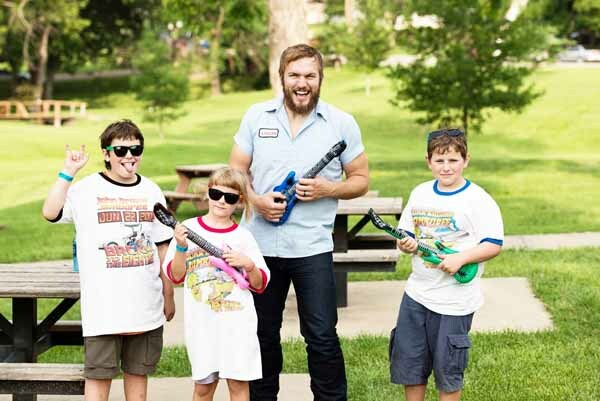 Another favorite part of my trip and certainly the most memorable was meeting Logan Mize. Logan is a country music artist from Kansas and he is nothing short of amazing. He is busy traveling, writes songs, has a family and at the same time works at promoting the awesomeness of Kansas. He and his crew arrived in the early evening on Saturday and before he could even get a bite to eat, he was happily sitting down with me and my kids so we could talk about many things, including Kansas. Logan enjoys the openness of the Kansas fields and how free it feels. He likes the wide open areas and how it has a lot of dirt roads. He has lived in Nashville but it didn&apos;t feel like home and by that he means the place he grew up, which is Clearwater, Kansas. Logan attended school there and his family runs the local grocery store from the butcher, his dad; to the baker, his sister; to cousins and uncles handling the other parts of the store. Kansas is also where Logan once dreamed of driving a station wagon with his friends while doing documentaries about our state. He was serious enough that he used to bid on eBay in hopes of purchasing a station wagon. When his first album was released, a friend surprised him with a 1989 Chevy wagon, complete with a picture of Logan&apos;s first album on the hood and sunflowers and a partial map on the side. The car has been to such places as a Tom Petty concert and Logan&apos;s opening show for Hank Williams, Jr.
Logan was down to earth and easy to talk to. My oldest thought it would be funny to show Logan a picture of me he warped on his iPhone and Logan immediately came back with a hysterical picture of himself on his phone (I could tell you all about it but we made a promise not to share it with anyone). During the interview my son showed his serious side as well, asking Logan which songs of his are his favorites. The answer? It&apos;s a toss up between Sunflowers and Leaving Carolina (I would have to agree). I left the interview thinking how it doesn&apos;t matter how good a person can sing or write or perform but it is also what that person is like when not on stage. Logan has it all and I look forward to watching his career grow. We ended our night with the biggest part of the event, the jamboree. The bands we heard were great, including the Midtown Violets and Logan Mize. I really liked Paramount as they were an 80s rock tribute band and since I knew all of the words to every song, I could be heard singing along, albeit off key. We missed one of the big shows of the night, Josh Thompson, because we were wiped from a busy day but hope to catch him in the future. Before I sign off from our visit back from the 80s, I would like to mention how friendly and helpful the event staff was at the John Brown Jamboree. Mike and Shelagh helped to ensure that we had a successful day and I would say it could not have gone any better. Thank you for welcoming us to your town!